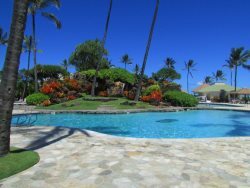 Paradise Awaits you at this Breathtaking Oceanfront Oasis with a Studio condo/hotel Stunning resort sitting on 3 mile stretch of glistening sandy beach on the eastern shore of Kauai. Explore the sandy beach, soak up some rays and play in the waves of the turquoise Pacific blue ocean. You will be surrounded by exotic lagoons, cascading waterfalls and lush tropical vistas, while knowing you have made it to paradise. Enjoy this perfect destination that is nestled on 25 lush tropical acres on the breathtaking eastern coast of Kauai. The resort is close to the airport, shopping, championship golf courses and all of Kauai’s incredible attractions, activities and adventures. This retreat offers luxurious accommodations with private balconies. Walk through the tropical grotto with waterfalls and a 75 foot lava tube slide, or relax in the spa tubs, or a swim in the sand bottom pool. After a long day of discovering the island come back to the SPA and enjoy a Hawaiian Rain forest Spa massage of hot stone rituals, facials and hand therapies. Wander through the 25 lush acres in this luxurious beachfront resort the encompasses the natural beauty of Kauai. You can rent a car for the days you want to explore the island with the car rental agency on-site they days you require a car. It was great, everyone was very friendly and helpful. I wouldn't describe the room as a condo, but a standard hotel room. The resort grounds were fabulous. The condo met our expectations if you understand that you are staying at a resort but do not receive full resort amenities (housekeeping, extra towels, coffee). Beautiful property! Everyone was helpful and available if we needed anything. Yes. Comfortable, clean, and quiet. It was excellent! Very clean and quiet. Staff were the friendliest we have ever encountered!